Although less well-known than some of his compatriots, Polish director Jerzy Skolimowski has built a unique, although little seen, collection of films both in his native Poland and elsewhere. Early in his career he served as a screen writer for both Andrzej Wajda and Roman Polanski (co-writing Knife in the Water) with whom, it could be argued, he shares a certain macabre sensibility. Made in 1978, The Shout is a post-Hammer British horror film perhaps more reminiscent of the films of Nicolas Roeg, particularly Walkabout and Don’t Look Now. 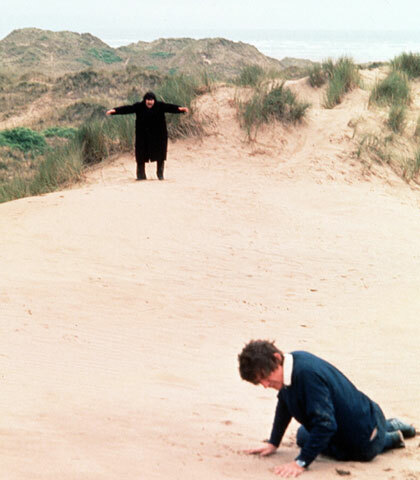 Like Roeg’s films it is intelligent, ambiguous and slow-paced and it puts much emphasis on mood of place – although in this case it’s a sleepy village in north Devon. It is the story of a man who can kill with a shout – a skill he learnt, we discover, whilst living with (what is often short-hand for a pre-civilised society) the Australian aborigines. A somewhat unreliable narrator recounts the events in flashback to the writer Robert Graves (on whose story the film is based) whilst the two men keep score during a cricket match. At times it seems like a well-directed episode of the Hammer House of Horror (if Harold Pinter had written it) but the mood and tension between the characters help it rise above that level. This is certainly helped by the top-class British cast – Alan Bates (in a strange reprisal of his role in Whistle Down the Wind) with Susannah York and John Hurt as the married couple whose complacent and staid relationship is slowly torn apart by this strange interloper. Bates’ mysterious ‘cuckoo’ dominates each scene but it is Hurt and York who give the film its humanity – although none of the characters are particularly sympathetic. One of the film’s greatest achievements is the way in which it makes such quintessential symbols of Englishness as cricket scoreboards, church organs and cottages seem so strange and alien (perhaps due to the film being made by a Polish director). The cricket match is played between doctors and patients at a mental home. Susannah York’s soul is ‘captured’ through the theft of that hippy symbol – a sandal buckle. This clash between the mundane and the supernatural is particularly notable in the contrast between the realist photography and the extraordinary soundtrack. John Hurt’s character is an avant-garde musician creating sounds through recording everyday objects such as a broken spam tin or marbles rolling in water and altering them electronically. The character’s music is heard throughout the film although Bates’ Crossley claims his music is ’empty’ and lacks imagination. His own supernatural shout doesn’t disappoint when finally demonstrated and actually sounds as if it might kill. But it is the cry of the peacocks throughout the cricket match that is perhaps the most eerie. It is a puzzling and ambiguous film that doesn’t seem to have any clear motivations but is more about creating a disquieting atmosphere – the slow pace certainly adds to the mood of intimate awkwardness. Whether it is a horror film or not is debatable but it undoubtedly succeeds in creating a disturbing and quite genuinely creepy world. Yeah, just saw THE SHOUT finally after being obsessed with Jerzy’s DEEP END for a while. Jerzy also shows up as an actor in EASTERN PROMISES and Julian Schnabel’s BEFORE NIGHT FALLS. Weird. I Highly highly recommend DEEP END. It’s similiar to KNIFE IN THE WATER, HAROLD AND MAUDE, THE GRADUATE and RUSHMORE ( I really think Anderson pulled some tricks from this one ). Cool Blog …….. RADIO ON is another great one. Glad to see some love. “The Shout” is brilliant, deviant and fully realised. The director is so in control of the film’s mood and pacing that we are bound to follow the unlikable characters through the outlandish material being presented. Worth watching twice in a row. Says something odd about sound artists. Count the Francis Bacon references. Watch where you put your shoes.